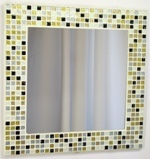 Home Studio crafted, fully tiled and grouted with small glass mosaic tiles, a choice of grout colours and a choice of Satin or Aluminium edging, this mosaic mirror will brighten up your walls, or with the optional stand can decorate your dressing table or other surfaces. 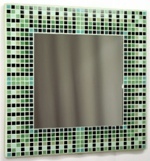 It is made from 416 tiles in 2 colours, with a nominal size of 35cm wide x 35cm high (approx 14 x 14 inches) and a 24cm x 24cm mirror. 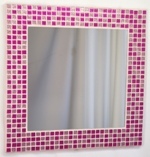 This photo shows the Pink Glitter 35cm Mosaic Mirror, in the Satin Edged format for wall hanging. 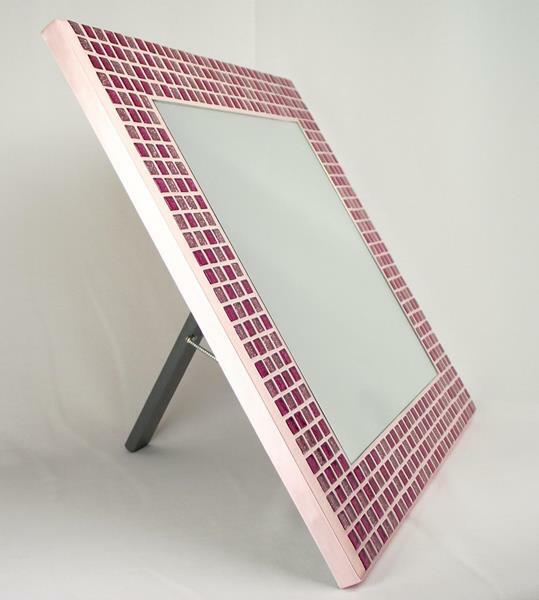 This photo shows the Pink Glitter 35cm Mosaic Mirror, in the Satin Edged format complete with Stand. 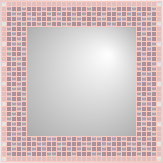 Add pink sparkle to your decor with this glittering mirror. 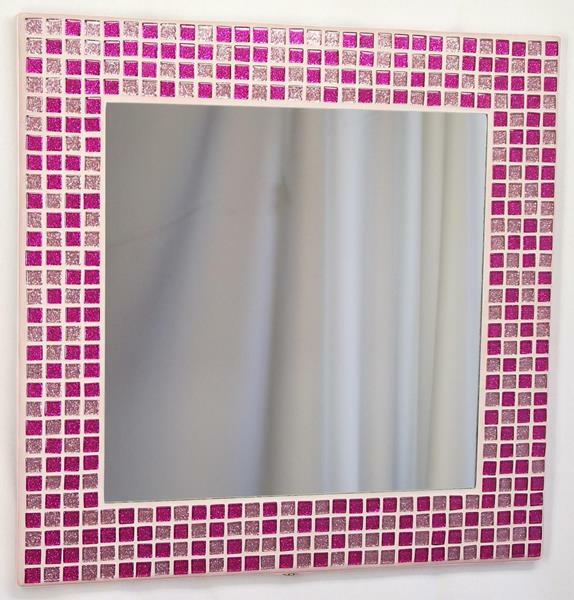 Light pink glitter tiles mixed with a darker fuscia pink glitter tile, with a pale pink grout. Satin Edge colour: Pale Pink. 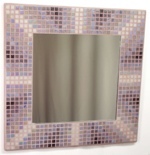 These special tiles add bright colours, sparkle and glitter to the design - each glass tile has a solid colour at its base with a layer of glitter or metallic colour encapsulated within, then a clear glass upper for a 3D effect of depth. 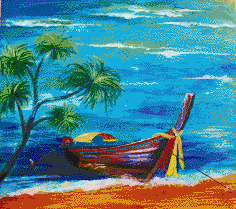 Some glitter colours fade in strong sunlight. 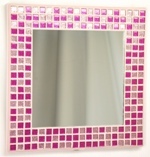 Grout Colour: Light Pink 12RW. Overall Size: 347mm x 347mm x 23mm approx. 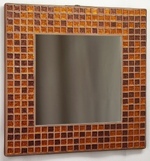 Overall Size: 347mm x 347mm x 32mm approx (with stand closed). 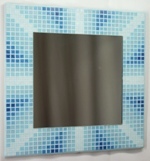 Standing Size: 35cm wide x 31cm high x 25cm deep approx. 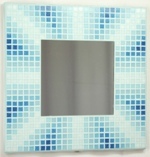 It is impossible to give an accurate indication of the finished mosaic colours: the tile colour shades vary from batch to batch, supplier to supplier (as is common with all fired glass). 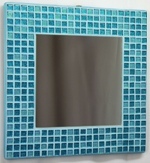 The colour shade seen is also affected by lighting conditions, adhesive and grout colour, etc. 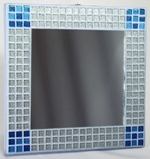 Finished grout colours will also vary due to mixing, texture, application or batch variations.